Home / Beauty / Fashion / gift ideas / gifts / Holidays / shoes / Skechers / Valentine's Day / Valentine’s Gift Ideas your Special Someone will Love All-year Long! Valentine’s Gift Ideas your Special Someone will Love All-year Long! Unsure of what to give your beau this season? Skip the quintessential bouquet and box of chocolates for gifts that your partner will find useful even after the hearts day is over! Luckily, global brand Skechers just has the arsenal of items you and your loved one can enjoy! Spoil your adventure seeker and explorer the perfect footwear, or gift the sneaker head with the most stylish and up-to-the-date shoe release! When in doubt? Surprise with a shiny new timepiece to replace his or her worn-out arm candy. No matter where you look, Skechers has all you need to give the perfect gift of style and comfort! For the wandering couple with many more sights to see and places to be, be sure to buy yourself and your partner with the best walking gear in the market. Hailed as the Number 1 Walking shoe in the USA, the Skechers Go Walk is the most obvious choice if you’re torn between giving a gift that can be both stylish, comfy, and durable. It is engineered with top-of-the-line comfort technology namely the innovative 5GEN midsole design and an advanced nearly seamless one piece fabric upper for breathability, as well as the renowned SkechersGoga Max insole for superior cushioning. On the outside it also features the 5GEN midsole for high energy return on every step and the Goga Pillars on the outsole for traction and bounce. So no matter where you opt have a romantic getaway, you’re sure to be happily comfortable! For the busy lady in your life, make sure they feel pretty and comfy whatever they wear. From work to night-outs, the perfect pair of ballet flats will go a long way. 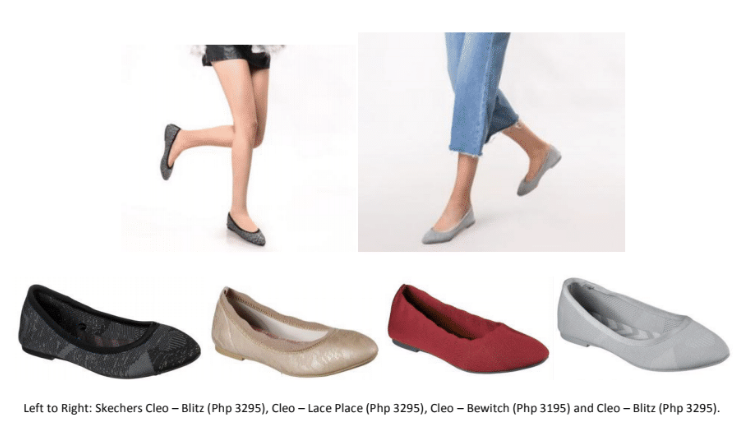 Make her fall in love with the Skechers Cleo, Skechers’ answer to the incredibly popular doll shoe and ballet flat shift—only now it is made extremely better with the infusion of the Memory Foam insole for excellent cushioning. It also comes in great patterns in multiple colorways to make the Cleo wearable with any outfit. Looking to buy your girl a sweet and sultry gift for Valentine’s? Pinks and pastel skirts and dresses can easily do the trick. 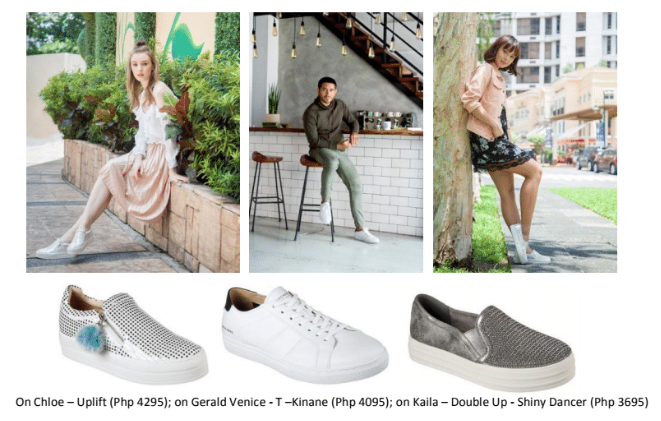 But for something more flashy and special, try the Skecher Street Uplift sneaker or the bejewelled Double Up- Shiny Dancer! This sequined and beaded platform sneakers not only look cute and trendy, it also has the newest Rise Fit Technology and Air-Cooled Memory Foam for added height and unparalleled comfort! For the ladies looking for the perfect pair for their partner, take it from Gerald Anderson and cop your bae a pair of the Skechers Venice – T – Kinane. This classic white lace up sneaker has a smooth leather with stitching and overlay accents and made soft and comfortable with an Air Cooled Memory Foam insole. Show your love by cherishing each moment spent with your partner. Nothing says “I’m thinking of you everyday” like a new shiny timepiece. Great news, Skechers Time offers various kinds of watches to fit any wearer’s style and personality. Choose from classic steel and sporty designs for the gift of time your SO truly deserves. For more Skechers shoes, visit skechers.com.ph, like Facebook.com/SkechersPhilippines and on Instagram @SkechersPh.